Classic car enthusiasts will find that pulling their beloved machines out of a winter slumber can either be a wonderful experience or a big nightmare. It all depends on how well the car was tucked in for its long winter nap. If the car was properly stored, turning the key and listening to the purr of the engine starts the season on the right note. If the storage process was rushed or not done properly, a lonely click, sputter or just plain silence could be the harbinger of much worse things to come. We discussed the proper way to store a car in Issue 118, and now it’s time to cover the the awakening process. If you stored your car according to our instructions, you thoroughly cleaned it, changed the oil and topped all other fluids. You then parked the car in a clean, dry, rodent-free place. You removed or disconnected the battery, and you inflated the tires to their maximum pressure. Since then, you have been patiently waiting for spring to arrive. 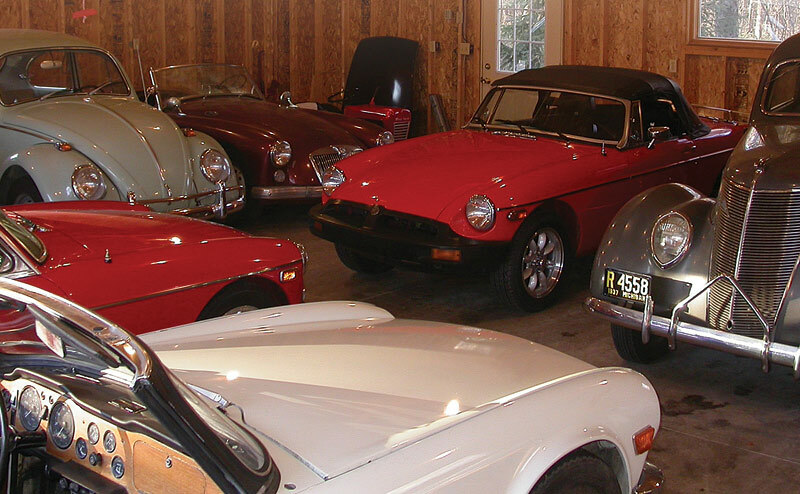 Before you even think of taking your classic for its first springtime spin, check all of the fluids. Assuming you followed our instructions, you’re just about ready to start enjoying your car again. While you’ll surely be tempted to hop in, turn the key, and go off for a long drive, we’re recommending a few preliminary checks. First, start by checking all the fluid levels: brake, clutch, coolant, engine oil and so on. If you topped them off last fall, they should still be full. If any of the levels have gone down, look under the car for the telltale puddles to see where the fluid is going. If any of the reservoirs are dry, don’t plan on a drive just yet—you’ve got repairs to deal with. Next, check and set the tire pressures. Now you can reinstall or reconnect the battery (if necessary) and make sure it is fully charged. It’s just about time to start the car, but you’ve got a few more checks to do. We need to make sure fuel is going to get from the tank to the engine. If you have an electric fuel pump, turn the ignition to the “on” position, but don’t crank over the engine. You should see all the gauges and idiot lights start to register and hear the fuel pump clicking. If the fuel pump isn’t clicking, don’t panic yet. Often, on British cars with SU fuel pumps, the pump will stick after a long rest, but a firm rap will start it up again. Try giving the pump a whack before you start to worry about repair or replacement. Look for fuel leaks along the fuel line and at the carburetor. On cars with carburetors, it’s pretty common for a stuck needle and seat to cause the bowls to overfill and leak. It may not be a factory-approved repair, but a careful whack can often solve this problem as well. Before starting the car, you want to crank the engine over for 30 seconds or so to build up some oil pressure. During its slumber, all of your engine’s oil has drained out of the various nooks, crannies and galleries where lubricant usually hangs out; this step will move the oil back to those places that need it most during startup. In cooler climates, you can usually just crank the car off-choke and it won’t start. If you have a manual choke, don’t pull it. If you have an automatic choke, don’t step on the accelerator pedal, as doing so sets the choke. If it’s warmer and you fear the car would start off-choke (or if you have fuel injection), pull the coil wire off the distributor to keep the car from starting. Then crank the engine until the oil pressure gauge starts to show pressure or the idiot light goes out. Now you’re ready to hear the car run again. Pull or set the choke and turn the key. The car should start pretty quickly and idle at 1500 to 2000 rpm on its fast idle setting. Before going for your first drive, spend about one minute making some more checks. Put the car in gear and drive forward a few feet—slowly—and then try the brakes. Still normal? Then pull ahead again and note whether it feels like anything is sticking. Assuming you’ve made it this far without any major problems, you’re ready for the first drive. Don’t head off for the interstate yet—you’re just going around the block for now. Cruise around your neighborhood for a few minutes and return home for a few more checks. Start by checking the temperature gauge; between your quick inspection and the drive, the engine should be near operating temperature by now. If not, you may have a stuck thermostat or other cooling system problem that needs to be remedied before you go any farther. After a quick drive around the block, hop out and check the temperature of each wheel. The wheels shouldn’t be hot, but if one feels warmer than the others, you may have a stuck brake. Now you can go for a longer drive. After you’ve gone a few miles, hop out and check the wheels/brakes again. If everything seems normal, you’re ready to go as far as you want. It’s important that the battery has extremely clean terminals and is properly secured. A bouncing battery is dangerous. While the foregoing is what we’d consider a minimum spring startup procedure—it should only take about 10 minutes—we also recommend getting a little deeper in your inspection some time after the initial drive. If your car is in pretty good shape, we’d recommend waiting 100 miles or a few weeks to make a more detailed inspection, as this lets any problems better reveal themselves. If your car is in rougher shape, the deeper inspection should start sooner. First, look at the battery and its terminals. The terminals should be absolutely clean and tightly clamped in place. The battery should be tied down with appropriate steel brackets. No bungie cords here, please. After that, get the car up on jack stands and carefully inspect the wheels and tires. Run your hands around them and feel for bulges or other problems. Look at the tread depth. Look for cracks on conventional wheels or loose spokes on wire wheels. If your tires are more than 5 years old, dry rot may be sneaking up so look for cracks, weather checking or other flaws that may turn into holes at inopportune times. Now it’s time to remove the wheels and tires and look at the brakes. If your car has disc brakes, look at the rotors—they should be smooth and free of grooves with uniform wear. As we said in our article about how to store a car, we recommend installing new pads on your car before it’s put away for the winter in order to keep the caliper pistons in their bores, as this prevents rusting. If you didn’t replace the pads in the fall, consider doing so now. 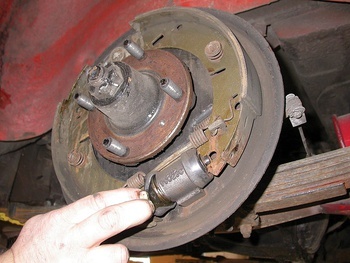 Continuing the brake inspection, carefully peel back the wheel cylinders’ outer seals and look inside. If you see brake fluid, you’ve got new or rebuilt cylinders in your near future. Assuming everything checks out okay, reinstall the drums and adjust the brakes if necessary. Proper brake operation is important, so we still have a few more steps to cover. While the car is still in the air, bleed the brakes. If the fluid is more than a few years old, you should probably flush it all the way out and replace it. Use a quality fluid, as the good stuff usually doesn’t cost much more than the bargain-priced brands. If the car has a hydraulic clutch system, why not bleed it, too? Pull the hand brake and make sure it is working. Afterward, release the hand brake and make sure it doesn’t stick. Before putting the car back on the ground, check the fluid levels in the gearbox and rear axle. If it’s been a while, change them. Change the engine oil if you didn’t do it last fall. While you’re crawling around under the car, look at the exhaust system. Are the mounts all still in place and is the rubber not dry-rotted? Is there evidence of leaks or holes? Does everything else look tight and secure? Are all of the suspension bushings present? Any leaking shock absorbers? The carburetor should also get some attention, so check the idle speed and idle mixture; is the choke working correctly, too? If the car has an electric fan on the radiator, make sure it operates after the car has warmed up. 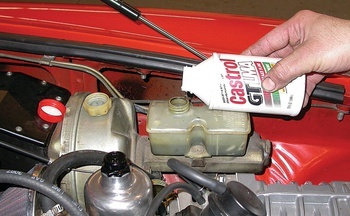 After shutting off the engine, carefully check the coolant level and the quality and age of the coolant. If the car passes all these tests, you can consider it ready to go. If you’ve been good about storing your car and going through a careful spring startup and inspection as covered here, you’ll be able to keep it safe and reliable. You’ll also be able to catch potential problems before they keep you stranded. Now that your car is ready for the road, go and enjoy it. ng rear drum brakes on an MGB. We pulled back the wheel cylinder seals so we could probe deeply for leaks. We found a bad seal, luckily before the brake fluid could soak through the pads. We’ve pulled a lot of cars out of good and bad storage situations through the years, and we have experienced a lot of common problems. Here are some of those issues, their causes and a solution or two. Dead batteries are probably the most common problem we’ve seen. They can usually be avoided by disconnecting and/or removing the battery when the car is put in storage. If your battery is completely dead, don’t be tempted to jump-start the car or use a jumper pack. Either method will help you start the car, but it will also put a real strain on your 30- or 40-year-old charging system. We’ve seen a lot of alternators damaged as a result of this practice. Generators seem more robust in this area, but don’t take chances—start the car on a fully charged battery. 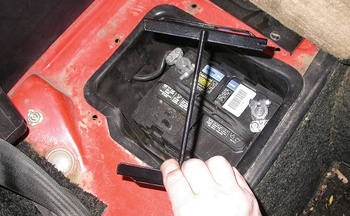 If the battery is partially charged but won’t spin the starter, then a jump start or jumper pack is okay. As we said in the main story, it’s important that the battery terminals are absolutely clean. If not, electrical gremlins will plague you all season. We’ve seen a lot of batteries unnecessarily replaced due to bad terminals. Finally, make sure the battery is properly secured to the car. If the battery can bounce around, dangerous consequences will result, ranging from broken cables to dented sheet metal to fires or explosions. It’s fairly common for brake components to freeze up during winter storage. Wheel cylinder pistons on drum brakes are notorious for rusting themselves to the cylinder. The pistons found on disc brakes can do the same thing. While you can sometimes free up a stuck piston enough to get the car to the shop, rebuilding or replacing the components before leaving your garage is really the proper solution. Don’t take chances with brakes. In the storage story, we told you not to set the parking brake. Why? Because parking brake cables and linkages very commonly rust themselves in position. Sometimes the brake shoes will rust themselves to the drums. If you left your parking brake on, make sure it fully releases. If not, you can usually free it up with some leverage and lubricant. Even if you didn’t use the parking brake, you may find that rust has made it inoperable or sticky when you pull the car out of your garage. Check and fix as necessary. If you’re seeing a theme here, it’s that things get stuck. Whether you have a manual or automatic choke, it’s usually linkage-based and therefore susceptible to sticking. When you start your car cold, make sure the choke is working and the engine runs on its fast idle circuit. As the car warms up, make sure the choke is releasing. Chokes that get stuck off will make the car hard to start and run poorly when cold. Chokes that get stuck on will make the car run rich and waste gas. And if the car has a catalytic converter, running way too rich can sometimes lead to a fire. Cleaning and lubrication are again the solution. Electric fuel pumps—especially diaphragm types like the SU units found in British cars—will also get stuck if allowed. Sometimes just a good whack will dislodge things and get them working again. Other times it may take cleaning or replacing the points, or a new pump. We’ve also seen mechanical fuel pumps that won’t prime. Usually that means they’re getting weak and it’s time for a new one pretty soon. Sometimes filling the gas tank or jacking up the rear of the car will build enough pressure to prime the pump. If the car was run hard and put away wet (or stored in a wet area), the clutch disc may rust itself to the flywheel or pressure plate. The result will be a clutch that will not disengage and that makes nothing but grinding noises from the gearbox when you try to put the car in gear. The easy remedy is pretty simple, but extreme caution must be used. First, push the car into a safe, open area, like a very long driveway. Start up the car and get the engine warmed up so it will start again easily. Now shut off the engine. With your foot holding down the clutch pedal, put the car into second gear and turn the key to start the car. The car will lurch forward (because the clutch is stuck) and, hopefully, sputter to life. Keeping the clutch pedal down, step on the brake and give the car some gas—then let off the clutch and give it some gas. Repeat until the clutch pops free of the flywheel. We rarely have seen fuel so bad that a car wouldn’t run, but we’ve seen cars that ran poorly on old fuel. We’ve occasionally seen fuel so old and gooey that it clogged the lines. If your gasoline is more than a couple of years old, you may want to drain the tank and refill it with new fuel before you start the car. If the fuel is just a bit stale, drive until the tank is nearly empty. Then refill with fresh fuel. Don’t even bother tuning until you’ve got good fuel. Think about this: You’re a rear axle seal, a water pump seal, a harmonic balancer seal or something along those lines. You’ve been cold all winter and there has been enough humidity to make your mating surface rust a little bit. When your mating surface has been put back in motion, the rust that was bonding you two together is now tearing at your edges. Your only recourse is to leak. Leaks are common after storage. Seal replacement is the only repair—unless you just want to live with the leaks, of course. Last but not least, we’ve seen a lot of rodent damage in stored cars. Mice and their bigger friends love to eat upholstery and make nests everywhere. If you’re lucky, you’ll just have to clean and vacuum the affected area. If not, you’ll be repairing whatever the mice had for a winter’s snack. The only cure is better prevention during the storage season.